The Great Feast of the Dormition of the Theotokos takes place each year on 15th August. It is upon this day that the Church remembers the death and the taking-up into heaven of Our Most Holy Virgin Mary, the Birth-giver of Christ. Preceeding this Great Feast is a two week fast. 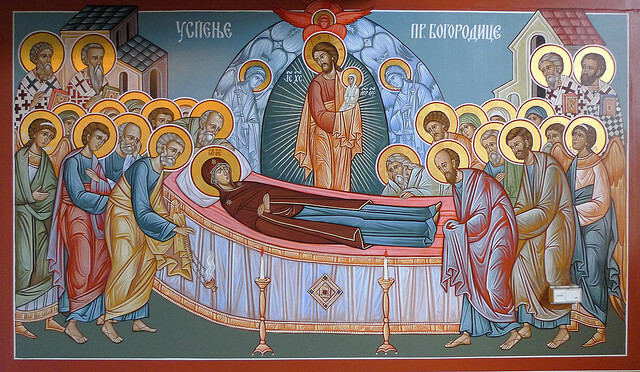 The Dormition Fast is sometimes misunderstood by Orthodox Christians as well as those outside of the Church. We understand the place of both the Lenten and the Nativity fasts, but the Dormition Fast can seem a little peculiar. Why would we fast before the death of the Mother of God? In very many ways, the Church is a single family, with brothers and sisters throughout time and space. We are all one body in Christ, one family. Our Church family ‘discovers’ (remembers), on the 1st August, that our Matriarch is on her death-bed. So what do we do? Perhaps the same as any other type of family would do in a similar situation – we make with all haste to her bedside, we sit with her, we pray with her, we ask her to pray for us, and in this way we also offer up a fast. After all, can we really be feasting when the Queen of Heaven lies dying? As we stand beside the death bed of Our All Holy Mother, we ask her for her prayers. She will soon take her rightful place beside the Throne of her Risen Son, Our Lord and God and Saviour Jesus Christ. We ask her to take our prayers with her. A Paraklesis is a service of supplication, and during the Dormition Fast it is appointed to be said each day to Our Most Holy Theotokos. A Paraklesis is specifically a service of prayers for the living. As it is primarily a Reader’s service, it can be offered either in Church or at home, making it very suitable for family use. Knowing that Our Most Holy Theotokos is eternally present at the throne of God interceding for mankind, we pray for her love, guidance, and protection.